As a student of the Word, you need doctrinally reliable and academically credible resources to guide you in your study. Whether you are studying for your own personal faith life, your academic studies, or your professional ministry career, you need writings from trusted authors that are convenient and affordable. 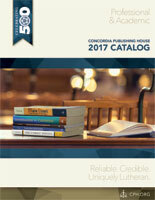 Concordia Publishing House strives to provide professional and academic resources that are faithful to Holy Scripture and the Lutheran Confessions. These are new volumes with Martin Luther’s Bible commentaries, sermons, prefaces, disputations, letters, and more—available in English for the first time. Gerhard’s Commonplaces (first published 1610–25) offer the most detailed theology of Lutheran orthodoxy after the Reformation. Called “the American Luther,” C. F. W. Walther promoted confessional Lutheranism in America in the nineteenth century by means of sermons, books, and articles. This landmark series provides a detailed exposition of Old and New Testament books, interpreting Scripture as a harmonious unity centered in Jesus. Save on all the newest volumes of Gerhard’s Theological Commonplaces, Luther’s Works, and Walther’s Works—plus get free shipping. Fill out the form at the bottom of this page, selecting the plan(s) you’d like to subscribe to. Call (800) 325-3040 to talk with a member of our customer service team.